The thick, gelatinous broth in veal stock, the rich, meaty taste of stew and the complex pork flavor of soup beans all come from a thick soup bone. 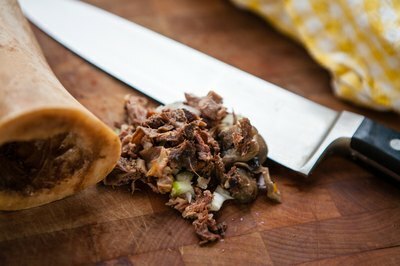 The best soup bones have a little meat attached, but clean bones will still add flavor. 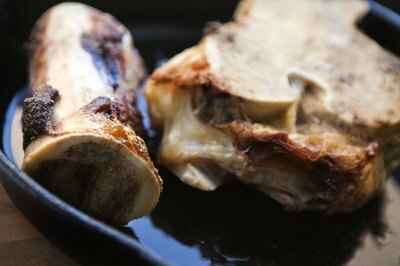 Use a raw bone, such as a ham hock or veal shank, straight from the butcher, or a bone left over from roasted meat or baked ham.You have to simmer soup bones low and slow to extract the most flavor and gelatin from them. 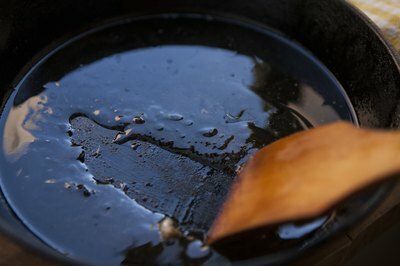 Trim all visible fat off your soup bones and coat them with oil. Roast the bone at 450 degrees Fahrenheit until it browns, about 30 minutes. Roasting cooks out the impurities that can cloud stock and broth. You can blanch the bones in boiling water for 5 minutes instead of roasting them if you don't want added color. Remove the bones from the oven and drain off any accumulated fat. 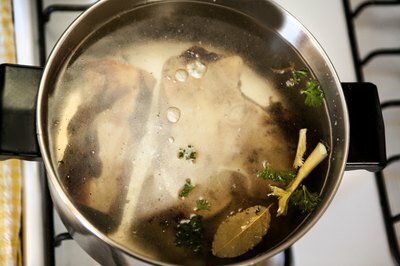 Place the bones in a soup pot and scrape up any browned bits from the bottom of the pan using a little water and a wooden spoon. Add the bones and the pan scrapings to the soup pot. Cover the bones with cold water and place the pot over medium-high heat. Bring the pot to a boil and immediately reduce the heat to a simmer. Simmer the bones slowly for 30 to 45 minutes per pound to extract the flavor. Add 1 cup of mirepoix, or 2 parts chopped carrots and celery and 1 part chopped onions, to the broth in the last 30 minutes of simmering. Skim the broth as needed throughout simmering. Remove the bone from the pot and let it cool enough to comfortably handle it. Remove all of the meat from the bone and chop it. Strain the broth through a sieve lined with 2 layers of cheesecloth and return it to the pot. 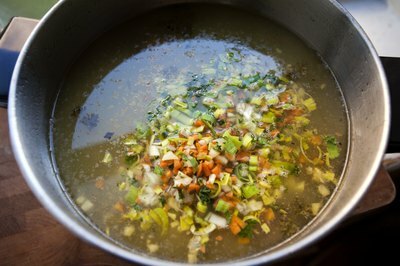 Add the remaining soup ingredients and cook until finished. 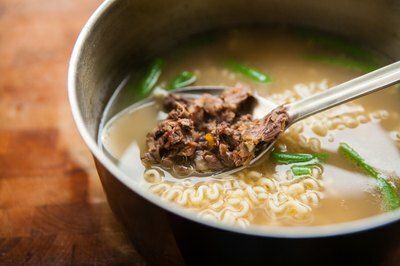 Garnish the soup with the chopped meat. What Is a Soup Bone?